Review: In 1962 Cold War America, mute janitor Elisa Esposito (Sally Hawkins) leads a quiet but lonely life working at Occam Aerospace Research Center in Baltimore, Maryland. Only her daily interactions with gay neighbor Giles (Richard Jenkins) and work friend Zelda (Octavia Spencer) break up an otherwise mundane existence. But when a mysterious amphibian creature (Doug Jones) is captured by Colonel Richard Strickland (Michael Shannon) and brought to the facility, Elisa discovers a kindred spirit and ultimately, love. Review: I think the best compliment you can pay any director is that if you were watching a film and you didn’t know who directed it, you could tell just by watching the movie. There are very few directors you can say this about. Guillermo del Toro is one of those directors. From The Devil’s Backbone, to Pan’s Labyrinth, to Hellboy, Del Toro’s films possess a distinct visual aesthetic and atmosphere that is uniquely his own. 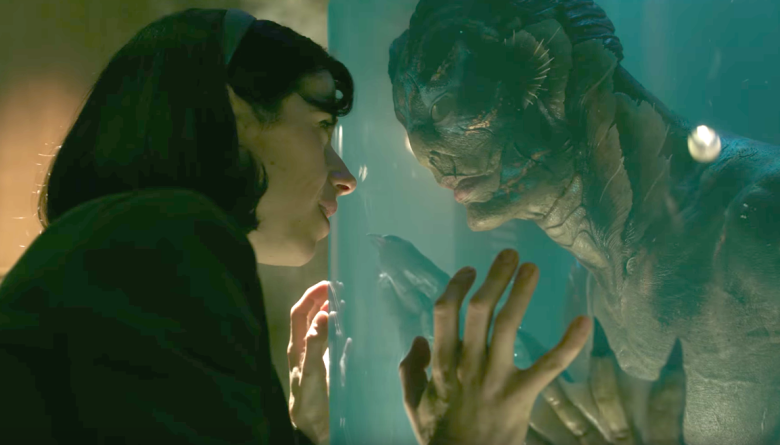 While already a celebrated director, The Shape of Water may be Del Toro’s masterpiece, and a film that will get plenty of attention come Oscar time. 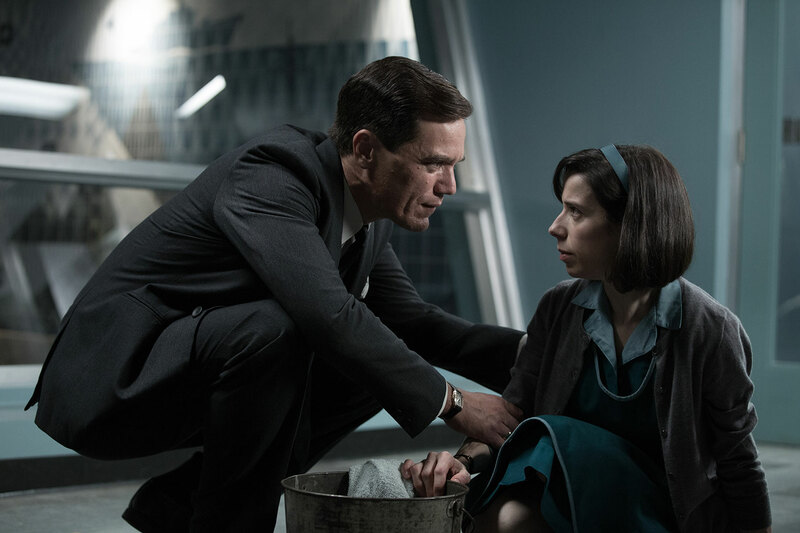 Visually arresting with a quirky but compelling screenplay from Del Toro and Vanessa Taylor, The Shape of Water navigates the genres of drama, dark fantasy, sci-fi, spy thriller, and romance with a deft hand. Heavily influenced by The Creature from the Black Lagoon and the 1946 version of Beauty and the Beast, only a director like Del Toro could bring a film like this to light, one that possesses its own unique flair yet remains accessible as a story. What I love about Del Toro films is that he recognizes that movies are first and foremost a visual medium. Anyone who’s seen a Del Toro picture knows how important color palettes are to him. He takes delight in bright colors like a starving man relishes fresh, warm bread. With The Shape of Water, the director manages to juxtapose dark and foreboding shots (most of the film is set at night and often in the rain) with bright colors, whether it’s the Creature’s sea teal and green skin or Elisa’s blood red coat. It lends the film a sense of the uncanny and you can see the influences of people like Mary Shelley and Dario Argento. Guillermo Del Toro reunites with past cinematographer Dan Lausten (Mimic, Crimson Peak) who brings the director’s vision to life. It’s one that’s sure to garner an Oscar nomination. It pairs perfectly with composer Alexandre Desplat’s (The Grand Budapest Hotel) melancholy and haunting score. Without the interplay of these three artists, I don’t know if The Shape of Water would be as visceral as it is. What’s odd is the fact that The Shape of Water as a story works at all. Think about it. Mute janitor falls in love with a fish-man? Sounds ridiculous. (Although the premise of John Wick sounds ridiculous and it’s anything but.) Yet because of Taylor and Del Toro’s wonderful script, the film proves a stupendous allegory about the human condition. It examines such wide-ranging themes as love, loneliness, rejection, intolerance, and compassion. Although the time period is five and a half decades old, the themes remain relevant whether it’s blatant misogyny, homophobia, and racism or the enduring quality of art and inspiration. It allows the audience to connect in meaningful and unexpected ways. 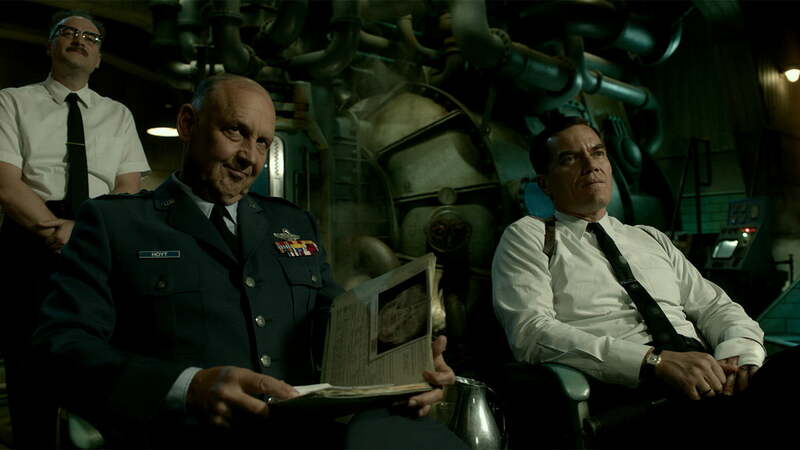 Once again Michael Shannon brings his simmering intensity to the fray as Colonel Strickland. He refuses to see the Creature as anything but a beast and anathema to his whole way of life. To believe anything else shatters the foundation of his entire worldview. And yet the reality of the Creature’s humanity dogs him at every turn, much like his fingers which continue to rot throughout the film. Likewise, Michael Stuhlbarg delivers a poignant performance as Dr. Robert Hoffstetler and serves as a good counterpoint to Shannon’s Strickland. While Strickland knows where his loyalties lie, Hoffstetler begins to question his own, as he observes the burgeoning relationship between Elisa and the Creature. It makes for an interesting dynamic. Octavia Spencer follows up last year’s Oscar nominated performance for Hidden Figures with another potential Oscar performance as Zelda, Elisa’s friend and co-worker. Just like Hoffstetler proves a natural counterpoint to Strickland, so too does Zelda to Elisa. Whereas, Elisa is mute, Zelda constantly talks, the topic often being funny anecdotes regarding her husband. However, it’s clear that Zelda is a true friend, someone who’s willing to go the extra mile, as Spencer proves late in the film. There’s a solidity and earnestness that can’t be denied in Spencer’s performance. 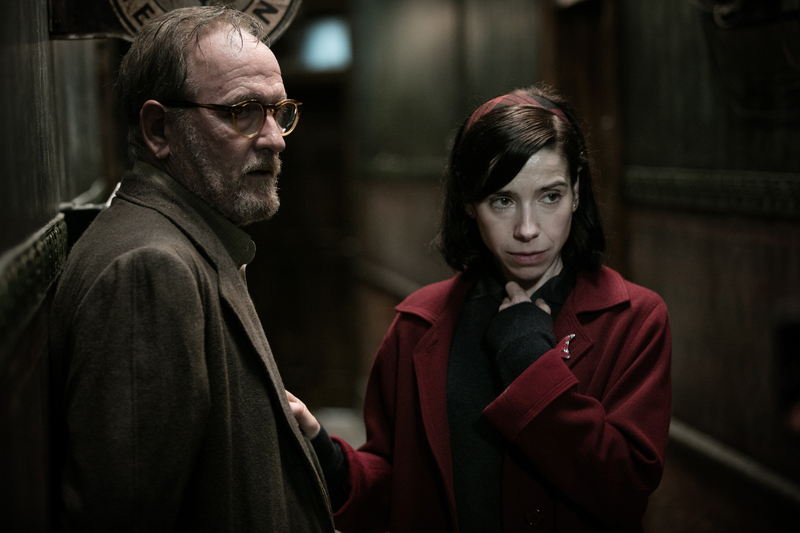 As great as the cast is, The Shape of Water is Richard Jenkins and Sally Hawkins’ show. Jenkins mesmerizes as Elisa’s neighbor Giles. In a storied and brilliant career, Jenkins delivers the performance of a lifetime as the introspective, shy, and somewhat reserved Giles. A closeted gay man in the early 1960s, Giles lives a life of “quiet desperation” hoping to gain back a job he was fired from and pining after a male employee at a local diner. He’s weak, yet we desperately hope sometime, somehow he’ll find strength. The seventy-year-old actor will most likely receive his second Oscar nomination come next month. Speaking of Oscars I’d be shocked if Hawkins doesn’t walk away with the golden statue come March. While Jenkins is mesmerizing, Hawkins is captivating. You can’t take your eyes off of her. The British actress delivers a powerful and gut-wrenching performance. It’s a complex, nuanced role made even more challenging by the fact that Elisa is mute. Elisa is a character we root for because we recognize her loneliness and desperation. We recognize what it’s like to be an outcast, to have no voice, to be the ultimate “other.” Elisa deserves love just as much as the next person and it’s something we desperately want her to experience. In the Creature she finds the perfect soul mate. They are a couple that recognizes the flaws and brokenness in each other and love each other in spite of it, perhaps even because of it. I’m not much of a romance guy when it comes to film, but this may be one of the best on-screen love stories I’ve ever seen on the big screen. In an age where the landscape is rife with tent pole movies like Thor: Ragnarök and The Last Jedi, The Shape of Water represents a refreshing alternative. It’s a beautiful, heartfelt, and breathtaking film that’s not to be missed.